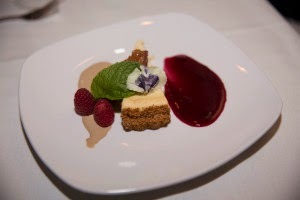 I had the pleasure of attending Dishcrawl Winston-Salem's first Secret Supper last night at 1703 Restaurant and Catering, after a wildly successful Secret Supper by Dishcrawl Greensboro last month. Along with some fellow foodies (all photos used here are courtesy of my very talented friend, Dana Dillehunt! ), I settled in for an outstanding meal and evening. 1703 Restaurant reserved the entire space for event participants. It was fun to see so many people interested in fine dining like me, and everyone's face lit up while reading the "Global Eclectic" menu. 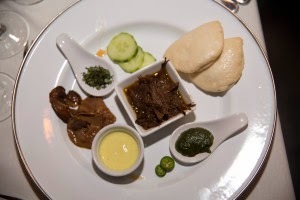 Each course was a tip of the hat to a different country, and many included Southern-American spins. It was also inspiring to see so many NC-based products and meats! 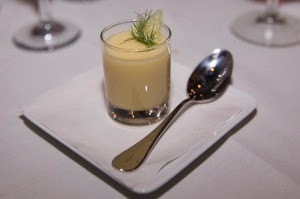 The Amuse Bouche (bite-sized hors d'oeuvre) looked like something from the TV show "The Taste." A beautiful slow-poached Hen Yolk rested in an Oyster Shell, and was dressed with a Sambal Oelek Vinaigrette, topped with Coconut Caviar. 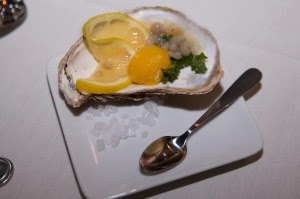 Molecular gastronomy is the science behind this "caviar," which made delicate pearls from oysters and coconut milk. The beverage pairings (from Mutual Distributing) were spot-on. It's definitely worth the extra cash to add the option. Experiencing an expertly-matched beverage to such exotic courses was surreal. Mother Earth Brewing (in Kinston!) offers a delicious wheaty beer called Weeping Willow Wit, which was a perfect match for the first course, Buttermilk Fennel Panna Cotta. 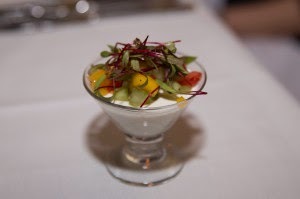 You'd traditionally find Panna Cotta on the dessert menu of an Italian restaurant, but this savory rendition was fabulous. Mango, Cucumber, Tomato and Greens topped the custard, and the Buttermilk flavor really tasted like elevated comfort picnic food. Lamb Pancetta was also sprinkled on top, but I was disappointed that this tasted and looked more like Peppercorns. I was slowly and steadily pacing myself, but one look and whiff of the second course and I knew I was going to have to re-think the whole "pacing" concept. 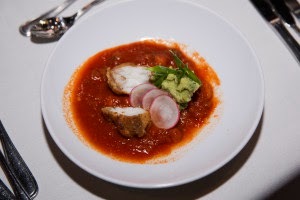 I was particularly fond of this ode to Spain - Monkfish over Spicy Octopus Stew, which paired beautifully with a Napa Valley Chardonnay Reserve. The fish was especially tender since it was wrapped in Joyce Farms Poulet Rouge Skin (a red chicken, found in the Piedmont, NC region.) The Stew was pretty sweet, but the acidity and tartness in the Avocado Salsa, Scallions and Radish helped cut this a bit. I keep wanting to make a joke about the Tortoise and the Hare, and how the Tortoise wasn't quick enough, so he ended up on our plates. Everyone was super excited to try the Turtle Stout Pie, and was surprised at how incredibly tender turtle meat is. This was definitely a first for me. The Foothills' Brewing People's Porter Stout comes through the gravy noticeably, and was paired with the dish as well. Unfortunately, the Puff Pastry pie top got a bit too soggy and took on a gummy texture. The accompanying salad of Micro Greens, Baby Beets and Pomegranate-White Balsamic Vinaigrette was a nice touch, but didn't seem to really go with the Ireland-inspired dish. At this point, any normal person may have been starting to feel full. But us Dishcrawl foodies? Nope. We had 4 more plates to go! My table loved the fourth course so much that we asked for seconds. Braised Goat from Yellow Wolf Farm in Walkertown, NC blew me away. This was essentially a build-your-own sandwich dish with warm Milk Buns, spicy Serrano Peppers, cooling Curry Yogurt, Pickled Shiitake Mushrooms, Cucumbers and Harissa Sauce. This was my introduction to Harissa, a North African hot chili sauce, and it's safe to say that I'm now an addict. I enjoyed the cooling, crisp Mohua Pinot Gris that was paired with this course, though some at my table remarked it was an odd choice. I shamelessly wiped every container clean here, and dove for the additional Milk Buns when they were delivered to our table. I may have lost some friends here, but it was worth it. Ah, the Intermezzo. Typically, this dish is used to cleanse your palate and therefore heighten your appetite, and it made perfect sense following the spicy, savory Goat dish. The Pineapple Haupia tickled my taste buds in all the right places. Much like a runny pudding, it highlighted flavors of Pineapple, Lime and Vanilla, and a colleague remarked that it even tasted like citrus cake batter. I would have been happy to end the meal here, but adjusted my leggings and prepared for the final two courses! I noticed a bit of lag time between the Intermezzo, fifth and sixth courses. I was beginning to settle into my food coma, so I'm not sure if the kitchen wanted people to have this break, or if there was actually an issue back there. 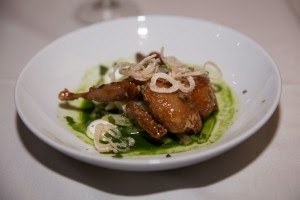 I have mixed reviews about the Corn Flour Dusted Quail. The bird was seasoned and cooked perfectly, with the Fish Sauce Caramel really highlighting the flavor of the tender dark meat, but the Papaya Salad with Kale Jus and Mint turned everything green. Granted, it was gorgeous, but not appetizing. The potent earthiness of the Kale overpowered everything, and the Coconut Creme Fraiche didn't stand a chance. What started as Fried Shallots quickly became soggy. The Large Reserve Pinot Noir from Willamette Valley did a nice job balancing the dish, but I believe too many Asian cuisines amalgamated here. The sixth and final course of the night had everyone buzzing. Cardamom Goat Cheese Tart is a savory, peppery version of Cheesecake that took a few bites to really get into, but the Creme Anglaise (made with Espresso from Krankies), Rosewater Berry Coulis and Hazelnut Lace Cookie were superb matches to this dessert. Each highlighted a different element and flavor, my favorite being the caramelly, Hazelnut Cookie. An edible pansy petal was delicately dusted in sugar and set atop the tart. I would have eaten a whole bouquet of them. We weren't told the country inspiration for this dish, but I would guess India. The Saracco Moscato D'Asti from the Piedmont Region in Italy is insanely sweet on its own, but paired with the peppery cheese tart, it was delightful. If you read this and thought "AWESOME, I want to do that! 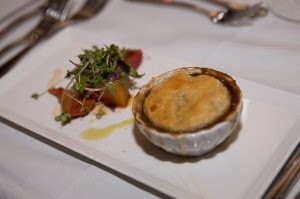 ", you should buy tickets now for Battledish, Dishcrawl's next event in Winston-Salem on February 8. 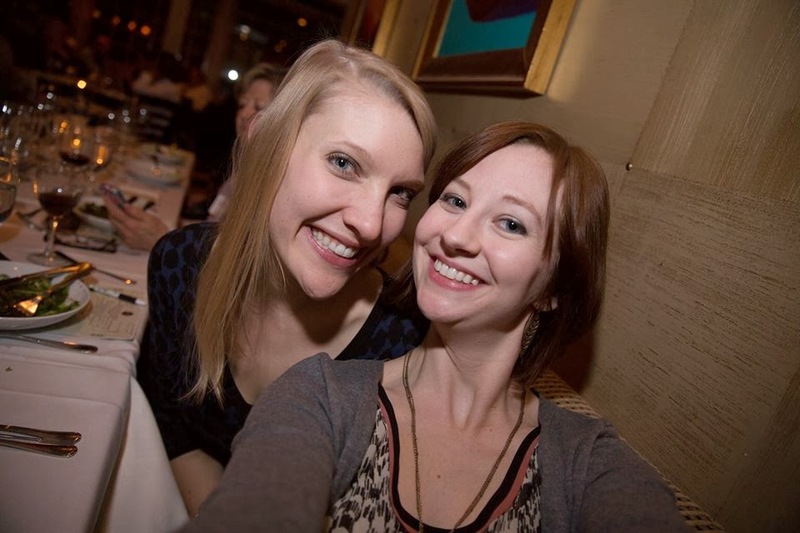 You can look forward to more Secret Suppers and exciting events like this, as long as you follow Dishcrawl (and me!) on Facebook and Twitter. Don't wait to get tickets though - these Secret Suppers won't be so secret for long! Photographer Dana Dillehunt & me! You kept me laughing in this review for sure :-) count me in for the Battledish in Winston! YAY!! It's going to be so much fun!